WITH his steady aim and quick reactions, he has achieved global recognition and five-figure earnings by excelling at a video game played by millions every day. Now a Glasgow teenager is preparing to take on elite gamers from around the world in the hope of securing the lion’s share of a $1 million prize pot at a US tournament. Mark Bryceland will this weekend pit his skills against the best players from across every continent at Call of Duty: Ghosts, the latest installment of the first-person shooter game that has become one of the most popular series of games ever made. Having already secured the European title and its £12,500 prize earlier this month as part of a four-strong British team, the 19-year-old has flown out to North Carolina for a week of intensive practice against crack US teams before the Call of Duty Championships gets under way on Friday. Depending on how he and his teammates in TCM Gaming perform against 31 other teams at the Los Angeles event, they could take home a sizeable part of the $1m prize fund, which will be divided up among the top eight teams. Overall success would net Bryceland and his team nearly a quarter of a million pounds, with lucrative sponsorship deals likely to follow. 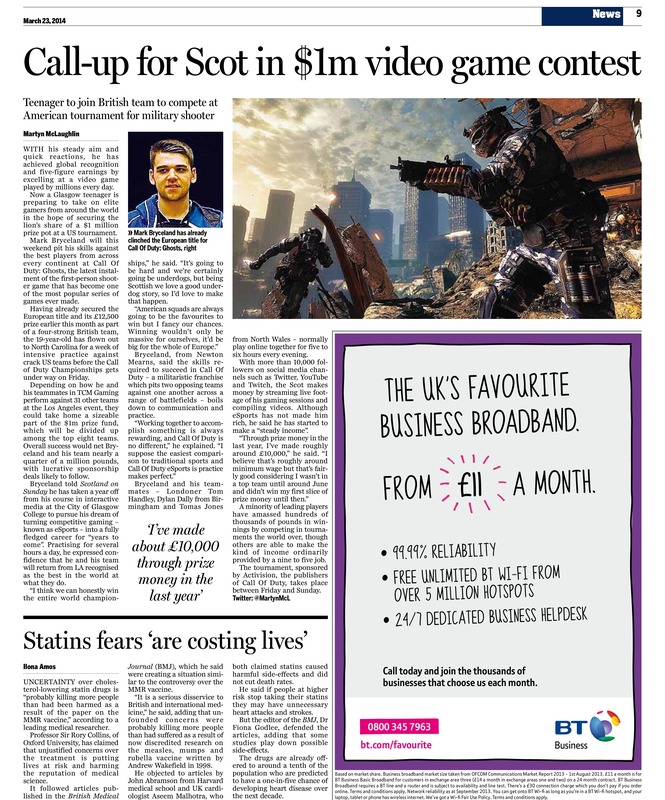 Bryceland told Scotland on Sunday he has taken a year off from his course in interactive media at the City of Glasgow College to pursue his dream of turning competitive gaming – known as eSports – into a fully fledged career for “years to come”. Practising for several hours a day, he expressed confidence that he and his team will return from LA recognised as the best in the world at what they do. “I think we can honestly win the entire world championships,” he said. “It’s going to be hard and we’re certainly going be underdogs, but being Scottish we love a good underdog story, so I’d love to make that happen. Bryceland, from Newton Mearns, said the skills required to succeed in Call Of Duty – a militaristic franchise which pits two opposing teams against one another across a range of battlefields – boils down to communication and practice. Bryceland and his teammates – Londoner Tom Handley, Dylan Dally from Birmingham and Tomas Jones from North Wales – normally play online together for five to six hours every evening. With more than 10,000 followers on social media channels such as Twitter, YouTube and Twitch, the Scot makes money by streaming live footage of his gaming sessions and compiling videos. Although eSports has not made him rich, he said he has started to make a “steady income”. A minority of leading players have amassed hundreds of thousands of pounds in winnings by competing in tournaments the world over, though others are able to make the kind of income ordinarily provided by a nine to five job. The tournament, sponsored by Activision, the publishers of Call Of Duty, takes place between Friday and Sunday.